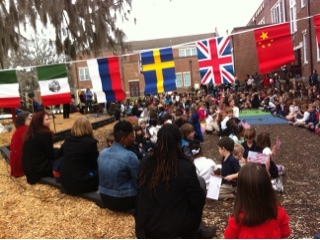 As part of our celebration of International Montessori Week, students at Ellis gathered around our playground's Peace Pole to share world-wide messages of peace. The 6th grade presented facts about Germany and then did a readers' theater production of the Grimm folktale "The Rabbit and the Hedgehog". The rain has finally stopped, and the beautiful sun is once again shining on our beautiful city! I hope you take advantage of the light and heat given off by the star at the center of our solar system today! You will have homework Monday and Tuesday night, as well as a good amount of classwork to complete. Wednesday, we will be having a quiz. It is important that you are on task at all times and working on your own at home to be sure you are prepared for this quiz. 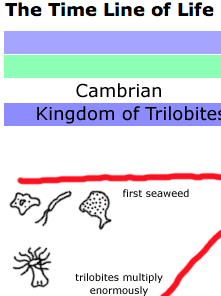 I've also assigned you two Compass Learning tasks to complete this week. Remember to take these tasks seriously because they will help better understand what we are talking about during our lessons. In science, we will continue to talk about the early astronomers i've introduced you to last week. Please finish your "Planetary Pathways" choice sheet by Friday. You will also have a test on Friday about each of the astronomers. Be sure to look over your study guide. Another great way to prepare is to listen as your classmates read you their astronomer letters and present their puppet autobiographies. Your journal entry that is due Friday will also require you to think critically about the astronomers. 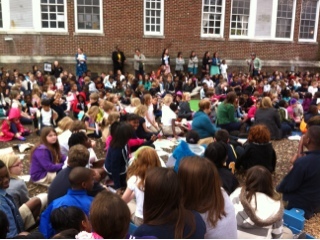 I'm really looking forward to the activities we are doing for Montessori Education Week! 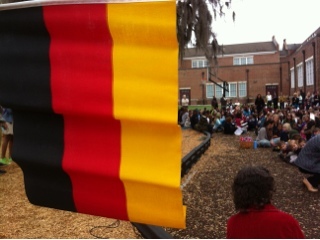 On Wednesday, my homeroom will present our Germany skit to the school at our special multi-cultural celebration by the Peace Pole. Ms. Carol's homeroom will work hard to create a festive bulletin board about peace in the school foyer. This Friday is a dress-down day for $1.00. All the proceeds will be donated to the American Diabetes Association "Kiss A Pig" fundraiser. Finally, this is the last week of the "25 Silver Acts of Kindness Challenge". Don't forget to be documenting all your kind actions in your journal. Will you reach your goal by the end of the week? 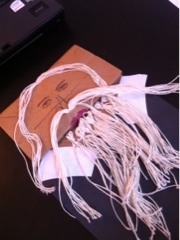 Many students are making puppets of the astronomers we've been studying. 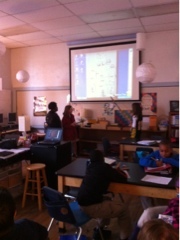 Along with the puppets, they are writing first-person biographies that they will then perform for their classmates. Who's ready for a puppet show!? Progress Reports were sent home for your review today. Please take a look at them, sign the coversheet, and return them to you homeroom teacher tomorrow (Thursday) am. If you have any questions or concerns, please take note of them on the coversheet and Ms. Carol or myself will respond as soon as possible. 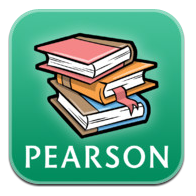 As always, grades are available 24/7 by logging onto PowerSchool Parent Access. We are starting the week with a holiday from school! There will not be classes on Monday because of Presidents' Day. On Tuesday, we will hit the ground running! In Math, we will continue our geometry work by focusing on surface area. We will need to remember all our practice with area as we investigate this sometimes tricky topic. Be expecting a fair amount of homework and classwork throughout the week. The classwork will include working with nets...no, not fishing nets! Geometric nets are like flattened out solids. We will have a quiz early next week on surface area of cubes, rectangular prisms, triangular prisms, and pyramids. In science we will start our studies on outer space! I've been looking forward to this all year, I hope you have been, too! I'll also give you the following study guide and vocabulary sheet to help focus your studies. Be prepared for a vocabulary test on Friday and a test on the astronomers next Friday. During your work time over the next two weeks, please complete the following choice sheet. As always, you will also have your weekly journal assignment due on Thursday. This week, I will challenge you to write some haiku poems! Since you have one less work day this week, you will be excused from completing a journal entry. Your weekly Compass Learning assignment will be a little different for the remainder of the year. You will now be required to complete TWO lessons that I will choose for you to focus on. These assignments can be found in your backpack in the program. You will need to complete both of these lessons by the end of the day on Friday. After you complete these two required assignments, you are free to choose additional assignments on your own for extra practice or review. It's time once again for progress reports to be sent home. You will get your report on Wednesday, and it is due back to your homeroom teacher Thursday. If you have any questions or concerns, please note them on the coversheet and we will get back to you ASAP. If you have any questions, or would prefer that your child “opt-out” of this presentation, please contact your child’s teacher and other arrangements will be made. Finally, since this Friday is the last Friday of the month, it will be a free dress-down day for everyone. Grace and courtesy is a foundational cornerstone of the Montessori Philosophy. As part of our "Silver Jubilee 25 Acts of Kindness Challenge", we've been focusing especially on the grace and courtesy aspect of "kindness". Valentine's Day is a great opportunity to show kindness to others! We've been using tangrams a lot in math class lately to help us understand area of polygons. 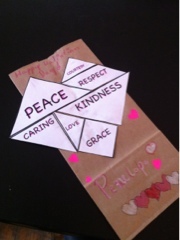 We used these tangrams to decorate our Valentine bags! 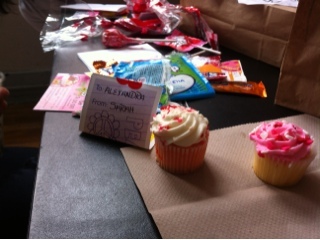 After our bags were created, we exchanged Valentines and enjoyed special treats. Please take some time to complete one of the surveys below. 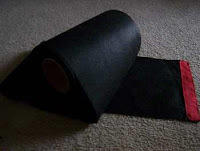 The results are anonymous, and will be used to improve our school. The Parent Survey is open to all parents to complete. The Community Survey is open to all who live in Chatham County. These surveys will be availble for you to complete until February 22, 2013. Happy Chinese New Year! Even if you don't celebrate this holiday, it can serve as a reminder to reflect on how 2013 is shaping up for you. What steps are you taking to make this the best year of your life? This Tuesday is also Mardi Gras! I know many of you enjoy a traditional King Cake this time of year. I'm sending you luck so you may find the prize in your piece of the cake! 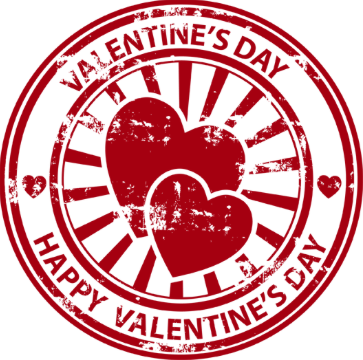 Speaking of celebrations, we will be celebrating Valentine's Day this week! Feel free to bring in Valentines and treats to share with your homeroom classmates. Please show grace and courtesy by including everyone if you are choosing to participate. We will deliver our Valentines Thursday, February 14. This is a wonderful opportunity to show kindness to your classmates and friends and spread the spirit of the Silver Jubilee 25 Acts of Kindness Challenge. What a festive time of year! But, we have some work to do this week, too! In addition to this math work, please complete you math journal by Thursday and your Compass Learning choice by the end of the day Friday. In science, we will continue our work with discovering patterns in weather. Your "Meteorology Matrix" choice sheet is due Friday. You will also have a test on Friday that will cover the main ideas we've been researching. The study guide I gave you last Monday will be a great tool you can use to prepare. Don't forget to refer to your three-column notes you took during the lesson, also. Be sure to be checking the daily weather that is posted every morning on the clipboard by the science materials shelf. Compare today's weather to that of the previous days, and see if you can take notice of the patterns we've been talking about in class. Finally, we will continue sending our weather observations to NASA through the SCOOL Ceres Project. I'll share with you some of the data we've collected so far, and we will compare it with satellite data gathered by NASA. I think you'll be very interested in seeing the correlation between our data and what the experts have gathered! After all your hard work this week, you will deserve a dress down day on Friday! It only costs a dollar with all proceeds going towards Ellis athletics. 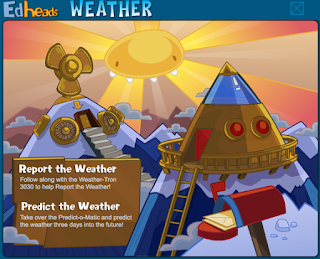 Today, we talked about ways to forecast the weather without the use of sophisticated weather instruments. 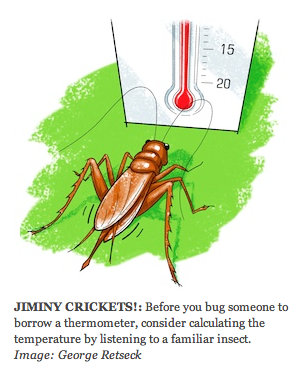 We used crickets to calculate temperature by counting the number of chirps we heard and plugging that number into a conversion formula. Check out this great Scientific American article all about it! In class today we found the area of the 7 pieces in a tangram puzzle. Below are some tangrams of your very own to cut out and use. I've also included a few extension activities you can try. Have fun 'graming! 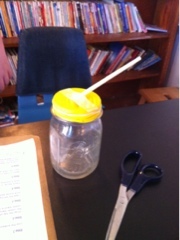 Today, some students chose to create some weather instruments using basic household items. Scientific arts and crafts, gotta love it! 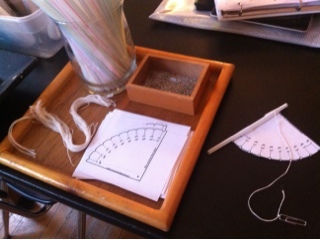 The barometer is made from a mason jar, balloon, and a straw. It can measure changes in air pressure. 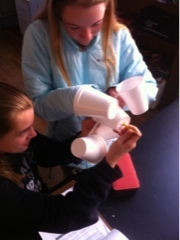 The anemometer is created using disposable cups and straws. It can be used to calculate wind speed. No matter who's team you are cheering for during the Super Bowl, everyone can agree that there is some serious math and science associated with the game of football! Check out these awesome videos all about the Science of NFL Football! 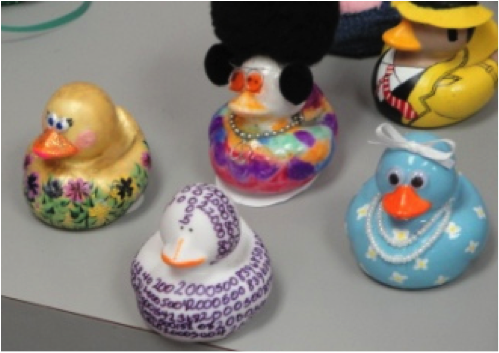 Punxsutawney Phil predicts Spring is on its way! It's official, Punxsutawney Phil the groundhog did not see his shadow this morning! According to legend, if he doesn't see his shadow Spring is on its way! This week, we will see how the professionals (meteorologists) forecast the weather. I'll present the following lesson Monday in class. This Friday, you will have a quiz on some weather words. Next Friday, you will have a test on the weather patterns we've talked about. Here are your vocab. words and a study guide to help you prepare. On Monday, we will also have a guest speaker who will talk to you about weather forecasting and safety. This will lead up to a severe weather drill on Wednesday that will be part of our observation of Severe Weather Awareness Week. Finally, we will continue gathering daily weather data to send to NASA as part of our work with the CERES project. In math, we will continue our transition into geometry. Up first will be area of squares, rectangles, parallelograms, and triangles! 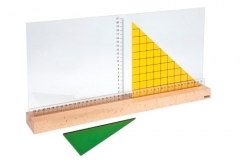 I'll show you an awesome Montessori tool you can use to easily find area of these shapes. After we've mastered the basics of area, we will then move on to using an equation to help us discover area of such shapes. Here's a handy-dandy extra practice sheet you may choose to do to help you. You will have some homework to complete to help you practice finding area. Be on the lookout for a quiz on area to be announced in the near future. In addition to your work with area, please be sure to complete your math journal by Thursday and your Compass Learning choice by Friday. It's going to be another busy, productive, and fun week at Ellis! I can't wait to get started Monday morning!